Pile weave is part of a family of woven fabrics created to produce pronounced or obvious protrusions of the constituent warp yarns within one set of the warp while a base structure of warp yarns maintains the tensile and structural integrity of the fabric in the machine delivery direction. The family of pile weaves includes terry cloth, velveteen, plush, and similar weaves in which a portion of the warp is extended to form an elongated, extended path from the flat plane of the fabric. 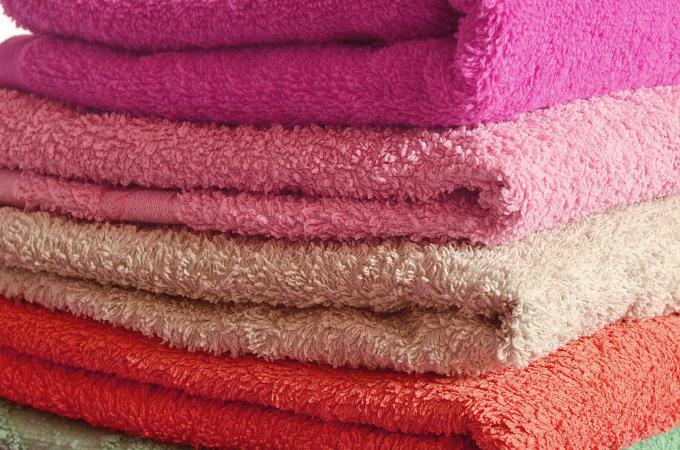 Terry weave fabrics are traditionally used as houseware items for bath towels, mats, washcloths, and robes, but are occasionally used for apparel items such as beachwear. Other pile weave fabrics are usually associated with winterwear clothing items because of their softness and warmth. The pile is defined as that set of yarns within the warp that is manipulated to allow large variations in the yarn interlacing lengths. The base structure of the warp that maintains a conventional mode of interlacings with the weft and provides structural binding and load integrity is known as the ground. Ground warps and pile warps are provided to the shedding and weft insertion sections of the weaving machine in separate deliveries. Conventionally, the ground and pile yarns are wound separately onto warp beams, but direct delivery of the pile from package creels is also possible in specialty weaves such as carpets. Pile formation is executed by formation of floats on either the face, back or both sides of the fabric. During this float formation, the interlacing frequency of the warp in the ground direction is much more frequent, creating higher tension in the ground warp than in the pile. The fabric take-up is actuated based on the ground warp advance rate, so the pile warp length becomes necessarily greater than that of the ground. The extra length of the pile is utilized to create loops, long floats, billowed structures, and similar protrusions from the fabric surface. In the case of terry pile weaves, the advance rate of the pile exceeds that of the ground to such an extent that relatively long loops are formed that are manipulated to form alternatively above and below the surface of the fabric during weaving. Pile weaves may be further enhanced or manipulated by variation in reed beating motion or variation of the position of the cloth fell during beat-up. In the first case, the reed sweep motion is restricted after some insertions and occasionally driven fully forward to allow maximum pile loop formation. In the case of variable fell position, the reed position and motion remain constant through each pick insertion; the cloth support, which determines the fabric fell location, is maintained in a position further away from shedding motion and closer to the take-up until loop formation is required. At loop formation, the fell is advanced simultaneously with and in opposite direction to the beat of the reed. The combination of the opposing reed and fell motions form the pile loop. See also Loom; Double Weave; Slack Tension Weave; Weave Types; Weaving. Collier, B., and P. Tortora. Understanding Textiles. Upper Saddle River, N.J.: Prentice-Hall Inc., 2001, pp. 312-316. Emery, I. The Primary Structures of Fabrics, pp. 148-149. Washington, D.C.: The Textile Museum, 1980. Gioello, D. A. Profiling Fabrics: Properties, Performance, and Construction Techniques. New York: Fairchild Publications, 1981.